GLORIFY and enjoy the living God by striving for worship that is pleasing to Him. NURTURE believers of all ages to become mature disciples of Jesus Christ: rooted in the doctrines of Scripture, zealous in prayer, holy in character and committed to one another. PROCLAIM good news of faith in Christ by words of witness and deeds of mercy, in Lancaster County and to all nations of the earth. Scripture regulates the elements of our worship. We approach the Living God with both reverence and joy in accordance to the Word of God. 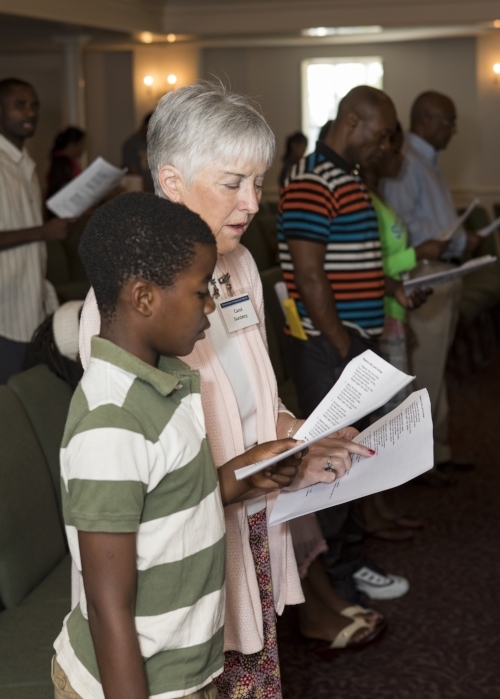 We participate with praise, prayer, singing, confession of sin and of faith, thanksgiving, petition; as well as, hearing and responding to Bible-centered preaching. Regular worship has transformational power as the people of God meet and see God’s glory revealed in Jesus Christ. Biblical principles and community inform our expressions of worship but no expressions of worship may go beyond that which may be deduced from the Scriptures. Our style takes into account church history and the culture in which we live. The Bible is the inerrant, infallible Word of God in its original manuscripts. The science of textual criticism has provided certainty that the extant text accurately represents the original manuscripts for 99.9% of the Bible. The remaining minor textual problems do not affect any doctrine or major teaching of the Bible. We can know with certainty that the Scriptures declare what God declares. We believe the Bible is the highest authority, and both reason and tradition must be judged by Scripture. Our constant goal is to hold forth the Word of God to a dying world and to always seek to be reforming according to the Word of God. Jesus Christ is the Way, the Truth, and the Life. He is at the center of our shared life as a congregation. We seek to be a Christ-centered, gospel-focused church in our faith and practice. The grace and truth of God in Jesus Christ is central in our preaching and teaching, in our worship, in our outreach, in our relationships, and in all we do. Our goal is that when people come to Westminster, they see Jesus Christ. Our church has several distinctives, but being Christ-centered is foremost. Community among members is a high priority. Our culture tends to be self-reliant and individualistic, but God sees us as intimately connected to each other because we are all part of the body of Christ and enlivened by the Holy Spirit. Just as the parts of our human body cannot function independently, so members of the church cannot function properly apart from community. We need each other to grow and thrive. We minister to one another with the same compassionate grace that God has lavished upon us and spur each other toward maturity in Christ. Elders shepherd the flock by encouraging and equipping every member to fulfill his or her role in the church. Salvation is completely by God’s grace. We do not contribute to our salvation in any way. Yes, we respond to the initiative of God, but even that response of faith is by God’s grace. We see reformed theology, as specified in the Westminster Confession of Faith and catechisms, as the best summary of the theology of the Bible. This theological structure is the “bones” of our church body but we “flesh out” our reformed views by explaining them in a winsome manner and welcoming those who do not hold to these distinctives. The great commission constantly calls us to an outward orientation. Jesus the “Light For The Nations” must not be hidden under a bushel. In love, we will both speak and show the gospel as we reach those captivated by every form of brokeness, sin, and ignorance. We sacrificially support missionaries, both locally and around the world. We believe that taking the gospel to those outside the church counteracts our natural inclination toward ingrowth and refreshes the joy of our salvation. We equip members to personally share the gospel and serve the local community with Christ-like love.